I’m starting a project to sense motion in our conference rooms at my office at SPR Consulting. We recently build a mobile web app that shows availability of conference rooms at our office. 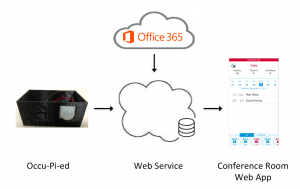 Currently, the web app shows availability based on the scheduling of the room resources in Microsoft Office 365. But we have a policy that rooms can be claimed if they are empty, so knowing whether a room is physical occupied is also important. For this project, I’m creating a motion detection device that sits in each conference room and senses motion in the room. The device checks for motion and reports whether there is motion (conference room is occupied) or no motion (conference room is not occupied) and then sleeps for a configured number of seconds. Because the sensor checks whether a room is occupied and it uses a Raspberry Pi computer, the name “Occu-Pi-ed” seemed obviously appropriate. The device reports the occupied status to a custom web service. Our conference room web app checks this occupied status and includes the status in the web app UI. This blog will cover the first half of the project by covering the electronics and wiring of the project. The second half (not yet written) will cover the programming on the Raspberry Pi and physical packaging into a custom enclosure. 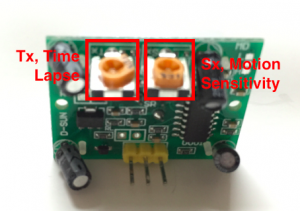 The PIR motion sensor has two potentiometers that allows adjusting the sensitivity of the motion sensitivity and time lapse (or stickiness of sensing motion). The potentiometers can be adjusted with a small screw driver. Be gentle and be aware the potentiometers only turns about 270 degrees. While holding the board with the potentiometers at the top and the sensor dome facing away, the left potentiometer (labeled Tx) adjusts the time lapse of the sensor. Turning the potentiometer clockwise causes the sensor to continue reporting motion even after the motion stops. Turning the potentiometer all the way counterclockwise causes the sensor to report whether motion is being sensed real-time. 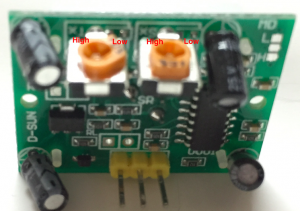 The rightmost potentiometer (labeled Sx) adjusts the sensitivity of the motion sensor. Turning the the potentiometer clockwise causes the sensor to be more sensitive to movement (especially farther away). Turning the potentiometer counterclockwise causes the sensor to be less sensitive to motion. Time lapse – Most PIR sensors will be connected to a microcontroller (or circuit) that will be “listening” to the PIR board for the pulse pin to be raised high, to indicate movement. Depending on the implementation, the connected microcontroller may poll the pulse pin periodically. Time lapse allows the identification of motion to be propagated through the pulse pin after the motion is sensed, for a configurable amount of time. This is very useful if your microcontroller, is for example, checking for motion every 30 seconds and then sleeping. You could miss the motion if you are just checking at a given microsecond every 30 seconds, so the board can propagate the sensing of movement for a longer period of time to increase the chance that your board catches the movement. 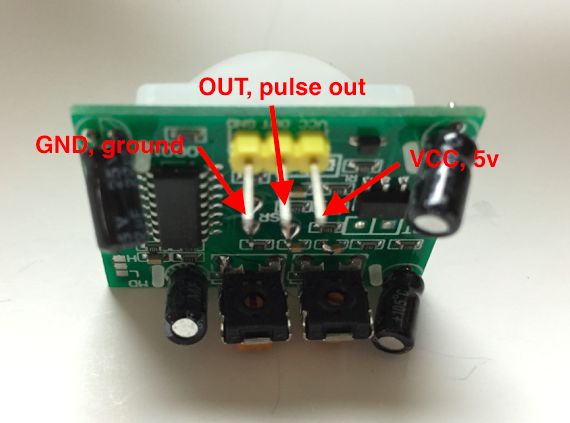 As you turn up the time lapse, the board increases the amount of time the pulse pin is high after sensing movement. From some playing around, it seems the potentiometer for time lapse is exponential and not linear, meaning that the time lapse gets dramatically longer as you turn the screw little by little. In my experimentation, if I turned the time lapse sensitivity to high, I waited over 15 minutes and the sensor was still sticky. Because I am impatient, I turned the sensitivity back down and unplugged the 5V jumper and plugged it back in to get back to a reasonable time lapse potentiometer setting. Motion sensitivity – From my experimentation, I found the sensitivity effected the distance more than any other aspect of its sensitivity. With the sensitivity set at its highest, it seems there may be some false positives, meaning the sensor every long once and a while pulses the output pin even though I was not aware of any movement in the room. For my final configuration, I have the sensitivity turned all the way up (turned to High location on image above) and time lapse set to 1/3 of the way between Low and High. I have found this creates the pulse out that is high for about 1.5 minutes whenever motion is sensed. Stay tuned, the next blog in this series will include the python programming on the Raspberry Pi as well as the physical packaging into a custom enclosure. On my Printrbot Plus (using Repetier v0.56 for Mac and Slicer for Mac v0.9.9) 3D printer, the height and width of my prints are very accurate to their intended dimensions, but I struggle with small parts or small details that extend out from the faces of my models, especially toward the top of my prints. See this image of the 5mm calibration cube as an example. As I mentioned in a previous blog, these printed models become deformed because the hot end that is extruding is running in such a tight/small area, that the filament never gets a chance to cool properly. Using Repetier/Slic3r, I don’t have any extrusion settings that allow me to slow down printing in small areas, such as the top of the cube and therefore the filament does not have a chance to cool properly. Sure, I could slow down the entire print to be a speed that is okay for the top to print properly, but that would make a 20 minute print take hours, which is not acceptable. I am happy to report that Simplify3D provides settings that allow me to print the 5mm calibration cube as well as I was able to print it using a cooling tower approach. 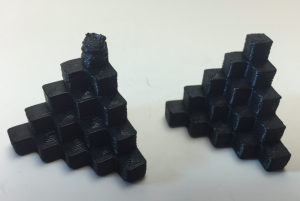 See the image below that shows side-by-side prints using a cooling tower and a print using Simplify3D. The left-most two pieces were sliced and printed using Repetier and Slic3r. 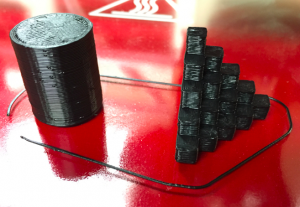 The far left piece was printed without a cooling tower and the middle piece was printed using the tower in the photo. The piece on the far right was sliced and printed using Simplify3D. As you can see in the picture (click it to see a larger version), the quality is almost identical for the middle piece using a cooling tower and the piece on the right, that leveraged Simplify3D settings to print properly. The simplify3D piece printed much more quickly and did not waste filament to print the cooling tower. As a result, I am declaring that Simplify3D’s abilities are superior to Repetier and Slic3r. As of this writing, the only downside to Simplify3D is that is costs $149, whereas Repetier and Slic3r are free. The images below capture the key Simplify3D settings that allowed the piece to be printed properly without a cooling tower. 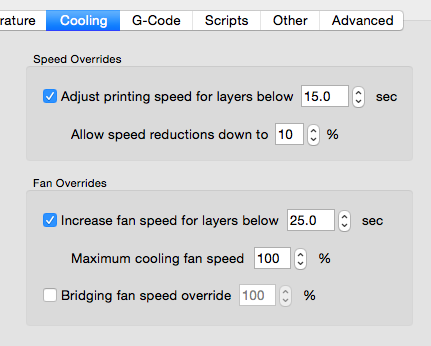 Inside the Simplify3D process (detailed settings that govern the slicing and printing), the cooling settings needs to include a speed reduction override for layers that take less than 15 seconds to slow down the extruder and the fan to be enabled to ensure the filament has time to cool properly. Additionally, on the Other tab in Simplify3D, the default speed settings were way too fast for me to get a good print (my config was defaulted to 3000 mm/minute). I experienced good results with my speed set to 900 mm/minute. First some background, I’ve calibrated my Printrbot Plus 3D printer’s extruder (using Repetier v0.56 for Mac and Slicer for Mac v0.9.9) to make sure the flow of filament is accurate using Josh Marinacci’s super simple technique (see Calibrating the Extruder section of this page). And I periodically check the accuracy of my prints by printing Matthew Croucher’s 5mm calibration cube. The height and width of my prints are very accurate to their intended dimensions, but I struggle with small parts or small details that extend out from the faces of my models, especially toward the top of my prints. See this image of the 5mm calibration cube as an example. The overall print quality and dimensions are accurate and square, but the top 5mm cube is very deformed. What’s more interesting is that the cube starts okay (although that is hard to see in the photo) for the first 3-4 layers of the top cube look pretty good and form a base of the square. But for layers 5+ of the top cube, it quickly becomes very deformed. It becomes deformed because the hot end that is extruding is running in such a tight/small area, that the filament never gets a chance to cool properly. Using Repetier/Slic3r, the extruder does not have a configurable option to slow down for just the top of the cube and the filament does not have a chance to cool properly. Sure, I could slow down the entire print to be a speed that is okay for the top to print properly, but that would make a 20 minute print take hours, which is not acceptable. 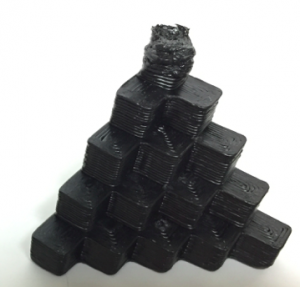 As the top of the cube is printed, lower layers of filament are not cooling and are not stable, so subsequent layers pull on the lower layers and cause it to be deformed. The problem is further worsened by the filament getting stuck to the bottom of the extruder’s hot end and causes the filament to be further deformed. 1. Create a cooling tower to create additional work for the extruder in order to allow the top cube to cool properly. 2. Use other CAM software that allows speed to be configured for small print areas. In this blog I will be describing technique #1, the use of a cooling tower to print small areas. A cooling tower is just a separate object to be printed that is the same height or higher than the piece that requires cooling. This could be a duplicate of the object you are printing, or in my case, a simple 10mm diameter cylinder the same height as the piece I am printing. 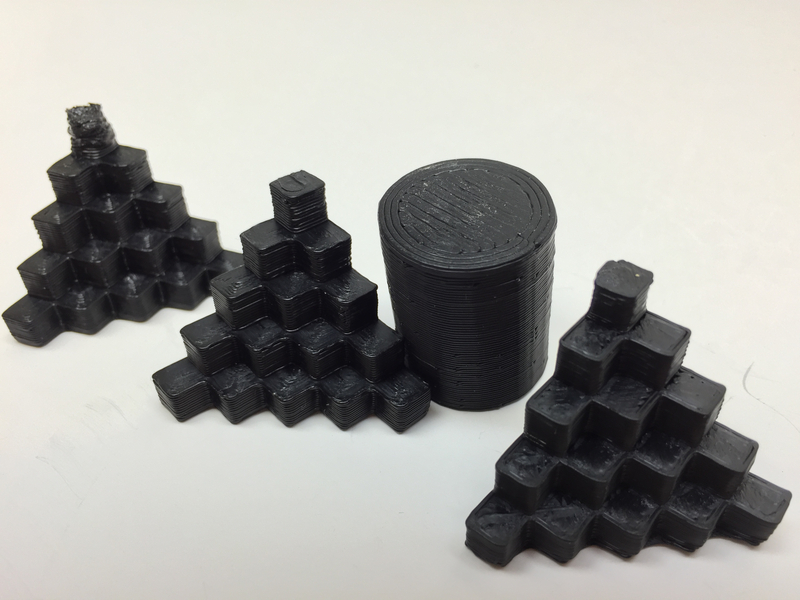 For the 5mm cube to be printed properly, I needed a 25mm tall cylinder. The cooling tower requires the extruder to move from your main piece to a secondary (sometimes throw away) piece and as it moves back and forth printing both pieces, it allows time for your primary piece’s layers to cool. The width of your cooling tower will allow you to determine the amount of time spent away from your primary piece. 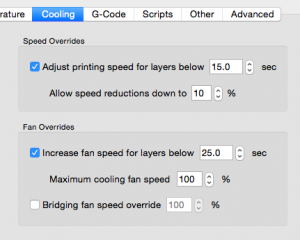 The time it takes to print the cooling tower is most of your cooling time. However, the travel distance from your two pieces (as physically laid out in your CAM software) will also provide a small fraction of additional time for your layer to cool on your primary piece. 2. 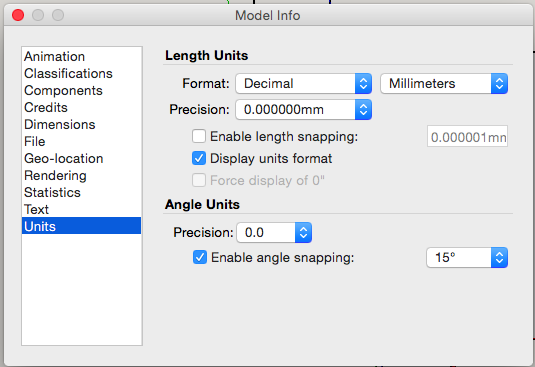 If necessary, adjust the the units of your model to have format of Decimal/Millimeter by adjusting the settings on the Window | Model Info dialog’s Units tab as show below. 3. Select the Circle tool and click ONCE on the canvas and then click on the Radius box in the bottom right corner of the window and type 6mm or whatever diameter you want for your cooling tower, then press Return key on keyboard . 4. Select the Select tool and click on the circle. Don’t worry if your colors are different, but you should see that the circle is selected you click on it. 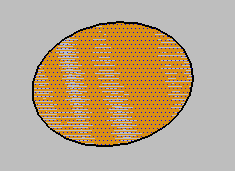 On my mac, the selected surface is shaded. 5. Select the Push/Pull tool and click ONCE on the circle’s surface that is already selected, then click on the Distance box in the bottom right corner of the window and type 25mm or whatever height you want for your cooling tower, then press Return key on keyboard. 6. You should have a cylinder that is the exact height and width you specified. 7. You can double check the height and width by selecting the Tape Measure tool and then clicking on opposing sides of the circular top or top and bottom to check the height of the piece. 8. Select the Select tool and click on the top circle of the tower. Then, triple click the top circle again, and it will select your entire model. Carefully right click your fully-selected model and select “Make Group” from the context-sensitive menu. (Note: Although not super intuitive, the Explode menu item will ungroup your model). Then, open the Entity Info dialog from Window | Entity Info menu item. 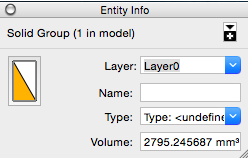 Once opened, verify the dialog indicates that your model is a solid group as shown below. This is critical as your model will not print properly if it is not solid. 9. Optionally, install the Solid Inspector extension by searching on “Solid Inspector” from the Window | Extension Warehouse search window. Click on Solid Inspector and download and install it. 10. With your grouped model selected, select Tools | Solid Inspector and verify in the resulting dialog that there are not errors, meaning that your object is solid. 11. If not already installed, download and install the STL export extension by searching on “SketchUp STL” from the Window | Extension Warehouse search window. Click on SketchUp STL and download and install it. 12. Once installed, make sure you grouped model is selected and select File | Export STL… In the resulting dialog, make sure you check the box to only export the selected model and use Millimeter as units. You can select either ascii or binary, binary is my preferred format because it is a smaller file. Finally click Export button to save your file to your local machine. Give it a descriptive name so you know what the STL file represents weeks or months from when you create it. 13. Using your CAM software of choice, drop the cooling tower as well as your piece to be printed on your virtual printing surface. And adjust their positions so they are at least a few inches apart. 14. Ultimately, you can create new cooling towers that are smaller in diameter to minimize the amount of filament required to make the tower. Or, get fancy and build a tower that starts thinner and expands in diameter at higher layers to correspond with the need for more cooling as the print gets toward the end. Here are the results from printing PLA on my Printrbot Plus (heated glass bed with temps: extruder 230 C, bed 80 C, the glass bed lightly coated with Vidal Sassoon extra firm hold #4 hairspray. And here is a comparison of the test piece on right that incorporated a cooling tower and piece on left that did not use a cooling tower. The difference is quite dramatic.